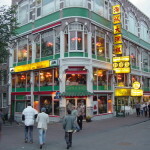 Oriental City is located right slap bang in the middle of one of the main tourist locations of Amsterdam. A top dim sum venue, perfectly placed for a pit stop during shopping, with excellent set menu deals. Chinese seafood catering well for large groups in Sydney’s Chinatown. From cheap noodle dishes to fresh lobster, this lively Chinese offers treats off menu for the adventurous.